I don’t know what’s going on over in Pakistan and especially Lahore with so much musical talent flooding over the borders to India lately. Among the finest of them might well be Jal, a young band that has released two albums so far, the latter being taken up for consideration here. I first came across them by chance in a music store in Delhi while browsing for some local bands and coming by their debut album Aadat instead. I first thought they were an Indian band and even though they are from Pakistan they do actually have a lot in common musically with their counterparts on this side of the border. In many ways Lahore is like the sister city of Delhi. The region has culturally so much in common that it’s no wonder music from from either address travels easily across the borders. I am not trying to hijack Jal over to India here, just pointing out the greater unity of the Indian subcontinent that reaches across political borders. 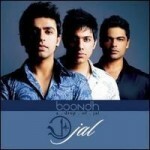 Jal is a Pakistani band for sure, but no less loved in India and I suspect in Bangladesh, Nepal and Afghanistan also. Jal was formed in Lahore in 2002 by Goher Mumtaz. He first found bassman Shazi to join the group and was soon after joined by singer Atif Aslam with whom they recorded their first hit single Aadat that received a lot of airplay and for which an immensely popular video was made. Actually it hit the Pakistani music scene like a storm propelling Jal towards real fame for the first time. Soon after however Atif Aslam departed due to musical differences and has since established himself as a successful solo artist. I will write about him in a later post. After Aslam left the band he was replaced by present singer Farhan Saeed. Jal then rerecorded the song Aadat with Saeed for their debut album of the same name which was released in 2004 and subsequently charted well. I first heard the song Lamhey from the album in the Bollywood movie Zeher and actually bought the soundtrack just for the song not knowing that Jal was behind it. The film version was a remix of the original. An adaptation of the song Aadat also appeared in a Hindi film called Kalyug. Let’s move on to the present album, Boondh. In earlier posts I have written about Sufi Rock and promised to post more on the subject. Strictly speaking Jal does not fall into this category though it does come close in places. We have a few mandatory Mast Qalandars (divinely intoxicated dervishes) whirling here and there, but essentially this is international pop-rock music with some alt rock ingredients added onto it. Having said that, a slight flavor of Sufi-like devotion does pervade the music along with a subtle yet distinctly spiritual element. With high expectations raised by the debut album I put on Boondh with some trepidation, not knowing what would come out of the speakers. But mind was set at ease right from the beginning as the album effortlessly launched into the clear waters of musical maturity. The first song Sajni begins with the crystal clear sound of acoustic guitars along with electric ones played without any distortion and the tune is catchy right off the bat. And the sound!!! I’m always on about the sound and production values, and excuse me for that, but sound is very important to me. Maybe that is why I have opted to slowly start my escape from the fidgety mp3 sound culture back towards real purveyors of sound i.e. vinyl (about which we can always argue later). I’m glad to report that on this album the soundscape is first class. And no wonder as it has been mixed, produced and mastered by Mekaal Hasan himself at his Lahore based Digital Fidelity Studios. If you don’t know who Mekaal Hasan is please refer to my earlier post by clicking here. The second song Raatein starts off on a heavier note and then develops into a funky song full of depth and musical expression. The bass and drum playing impress me a lot on this piece (what can I do, I’m a bass player myself as you might know by now). Humein Itna Pyar is a splendid love song while Moray Piya is a relaxed mid tempo waltz. Main Mastt Hoon brings us close to Sufi Rock with its more ethnic elements contrasting nicely with the more pop elements. Intoxicating indeed. Mahia, Payal and Chup Chup are relaxed and soothing and pleasantly link the lively first part of the album with the intense ending as Kia Se Kia and Yeh Mera Pakistan bring the album to it’s conclusion with their anthemic motifs. The experience does not end there as there are two alternative versions of earlier songs Sajni and Humein Itna Pyar. The first one is a beautiful slowed down piano version and the second also is a significantly slower tempo take on the song with an almost New Agey ethereal quality to it. I am usually rather opposed to all kinds of bonus and extra tracks on an album. I feel that they distract from the artistic whole of the album as it was originally intended but in some rare cases they compliment the overall effect. This is one of those times. I don’t what it is about Indian and Pakistani rock bands but they tend to have a very uplifting quality about them which is not always the case with western ones. Maybe because artists in this part of the world are still rooted in the tradition, sometimes lost to the west, that art is essentially a divine form of self expression and meant to bring both performer and listener closer to the spiritual reality. The fact that Jal performs in Urdu and Hindi does not in any way hamper the listening experience for someone that does not understand the language. The music is powerful enough. I will be surprised if Jal doesn’t soon start touring internationally and when they do I suggest you check them out. Those living in India and Pakistan don’t need to be told twice to do so. To buy the album from the amazon.com powered store click here. You have great information about music, I also play guitar and i bought guitar when Jal first album released. Jal is the band who changed the bogus scene of Pakistani music Industry into Rock scene, after their first album, many stars were recorded their songs but couldn’t approach on this level of fame where Jal is standing.